Long lashes and full eyebrows are at the height of current fashion. As thousands of consumers flock to various offline and online stores to seek a product that might help them obtain their beauty goals. 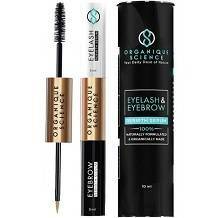 This review will investigate the claims of Organique Science’s Eyelash And Eyebrow Growth Serum. Claims that suggests anti-inflammatory, hair growth, hydrating and repairing benefits. The manufacturer has made the statement that this product is completely natural and chemical free. With its ingredients supposedly providing a safe formulation that leaves lashes and eyebrows luscious. Ethylhexyl Palmitate, derived from palm oil, is a natural alternative to silicon. Providing the hair with a smoother feel. Rice Bran Oil is rich in Omega-3 fatty acids, which nourishes the hair and protects the skin from UV damage. Cannabis Sativa Oil, or Hemp Oil, helps to moisturize the skin around the follicles while stimulating hair growth. Meadowfoam Seed Oil is used as an emulsifier that has hydrating qualities. While Linoleic Acid helps to prevent water loss and promotes hair growth by keeping strands in good condition. While the ingredients that were listed for this product seemed great, we were unable to find any proof of this formulation being clinically tested. Unlike competing brow/lash serums that contain at least five patented and proven ingredients. It is stipulated that this serum should be used once a day, on eyes/skin that is clean and completely free of makeup or product. Using the applicator tip, apply serum to the lash and brow line. Following this, massage the product into the skin. For the best outcome, you should use Organique Science’s serum for a minimum of eight weeks. For a tube consisting of 10ml, you will pay $29.99. And while there are no major discounts or special offers currently available – you can save 5% if you subscribe to the manufacturer’s website. We are happy to find that the manufacturer has a risk free returns policy in place. If you are unhappy with your purchase, for whatever reason, you can send it back for a full refund or replacement. Although upon further investigation we found that this policy only applies to first-time customers and does not apply to those who have subscribed. You have 60 days in which you can return your purchase. In conclusion of this review of Organique Science Eyelash And Eyebrow Growth Serum – we enjoyed the natural aspects of this product and that this brand does not test their cosmetics on animals. And while we found positive customer reviews, the uncertainty that comes with unproven ingredients and a somewhat misleading returns policy has led us to believe that there are other products on the market (with more confident evidence backing them) that could be the lash and eyebrow solution you have been looking for.